Ladies and Germs !!! Step right up to see the freak of nature !!! Yes - From the dark heart of Africa we present (drum roll)...... A DECIDUOUS SPEKBOOM !!! 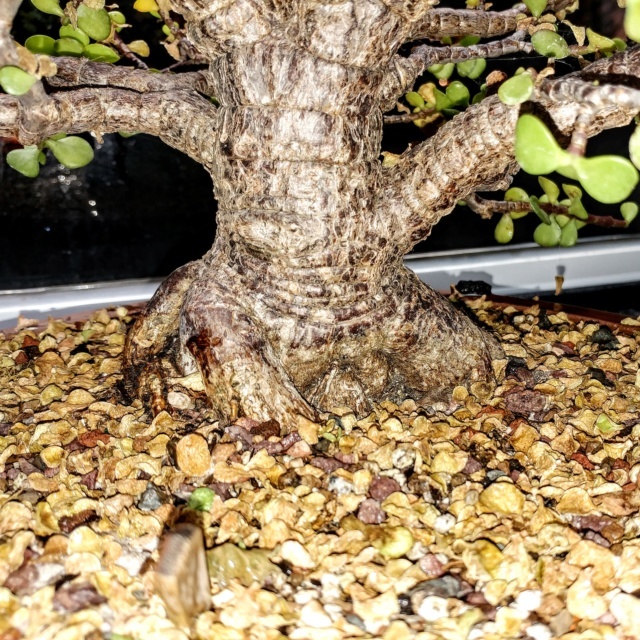 I have a prrtulacara for many years , and never heard the tree referred to a Spekboom. It's hard to tell from the pic's, but you may not be giving the tree enough of water. 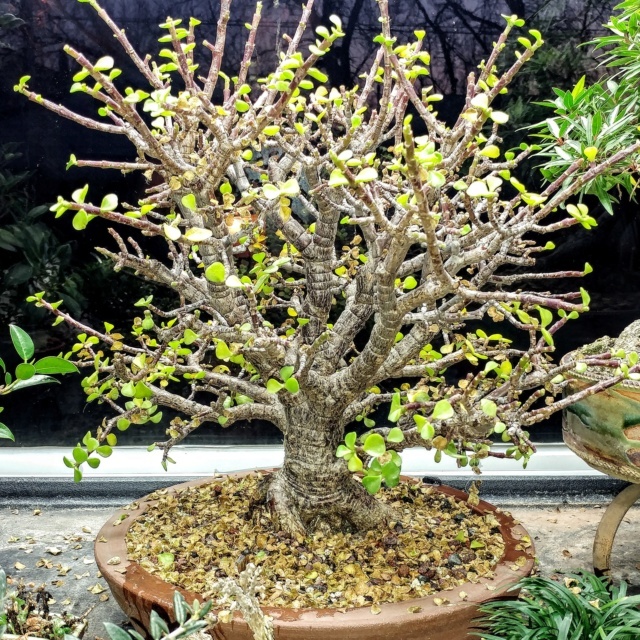 The portulacara is a small leaf jade, so treat them the same way as a jade. From the pic's the tree needs to be cut back and opened up, so more sun light can into the internal buds. When was the last time this tree was repotted, is the water running freely from the holes in the pot. Also clean off all the old dead leaves off the soil, or you may get bugs. Tony - It is not a water issue (i have experimented)... I have spoken with bonsai friends in varying climates and many experience the same seasonal thing. They need to have approximately the same light inside as outside for at least one month before you bring it indoors. I put mine on lower benches all summer, but move them to less light beginning ~August~. They need to get used to having less light instead of suddenly going from full sun to approximately a tropical Hell. It's like you going from outdoors to inside a closet, -your light receptors need to take time to adjust, and so do theirs. now that sounds like sound advice ! Hi, I live in the Eastern Cape of South Africa and the Spekboom is one of my favourite trees. When we visit the Addo Elephant National Park, it always amazes me how tall they can get. Elephants LOVE eating them and can completely vanish inside a Spekboom forest. I've seen may variants while walking around here, variegated, green leaf, yellow leaf, large leaf, small leaf, etc. but I can't say I've seen deciduous. They do respond to their environment fairly quickly. 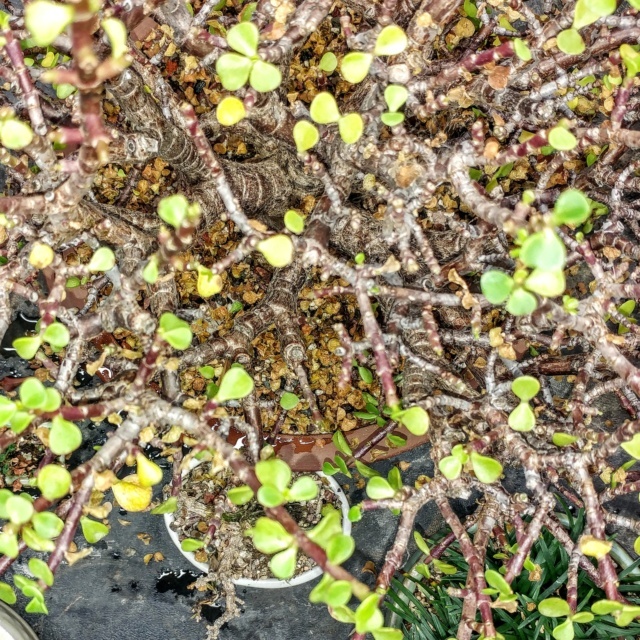 The leaves usually go yellow if the plant gets too much water, or they grow small leaves if they're in full sun all day. So perhaps, it's responding to the colder conditions in the north. You are right though in their adaptability !!! Are you going to trim back those long straight bits and maybe remove a few of the inner trunks?